It's so fast it'll make you hate your ISP. I'm standing on the corner of 15th Street and Third Avenue in New York City, and I'm freezing. But my iPhone is on fire. After connecting to one of LinkNYC's gigabit wireless hotspots, the futuristic payphone replacements that went live for beta testing this morning, I'm seeing download speeds of 280 Mbps and upload speeds of 317 Mbps (based on Speedtest's benchmark). To put it in perspective, that's around ten times the speed of the average American home internet connection (which now sits at 31 Mbps). And to top it all off, LinkNYC doesn't cost you a thing. Of course, my experience was a charmed one. The LinkNYC hotspot (or Link, for short) I tested went live just a few hours before I arrived, and there were only a handful of other people on it. I was also standing right in front of it -- speeds will vary depending on your distance, as well as the type of device you're using. Still, seeing Speedtest's bandwidth meter rocket to 300 Mbps was astonishing. It felt like I was staring at the future of urban internet access in my cold, gloved hand. LinkNYC is the culmination of New York City's big push to modernize payphones. Its tall and thin kiosks feature gigabit fiber connections (yes, most are plugged right into fiber lines) delivered via 802.11ac WiFi, USB charging, free voice calls, and a tablet for internet access, maps and directions. 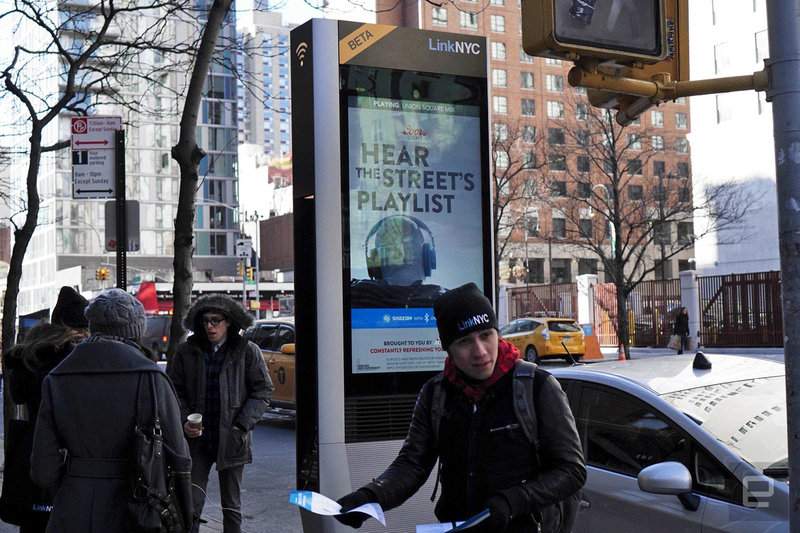 They also sport two large screens which display ads (the only way LinkNYC is making money, at the moment), as well as public service announcements. Wireless range clocks in at 150 feet, though as always, that may be affected by obstacles, windows and walls. Each kiosk also offers a private, fully encrypted network accessible by devices that support Hotspot 2.0 (at this point, LinkNYC only supports Apple gear). Signing onto a Link for the first time was surprisingly easy, as far as WiFi onboarding goes. After joining the "LinkNYC Free Wi-Fi" network, you just need to plug in your email address into a landing page to get connected. If you've got a Hotspot 2.0 device, you'll automatically get a prompt to install a security key for the the private LinkNYC network. I had no trouble connecting to the kiosk with my MacBook Air while sitting in the Starbucks right in front of it. The process was a bit more complex for my iPhone, since I wanted to test out LinkNYC's encrypted offering. After receiving the prompt to install the additional security key, I had to manually approve it and restart my WiFi before my phone phone would hop onto the private network. Unfortunately, while I wanted to test out LinkNYC's estimated range this morning, my iPhone ended up dying before I could (likely because I had it exposed to the extreme cold for a while). On my MacBook Air, I saw speeds of around 70 Mbps up and down while sitting just a few feet from the Link. That speed was likely being limited by my laptop's connection to AOL's VPN, which can't be disabled easily. Being indoors definitely slowed things down a bit as well, but that's still insane speed for free WiFi. It's likely a great deal faster than your home internet connection, unless you're paying for an expensive 100 Mbps plan. Even with slower speeds at greater distances, I wouldn't be surprised if some New Yorkers end up dumping their home ISP and using Links full-time instead. 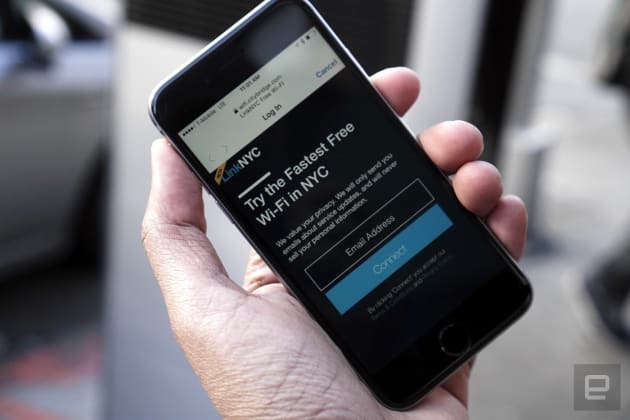 LinkNYC representatives say they won't stop anyone from doing that, though they might have to throttle data hogs who end up ruining the experience for others. Links could also end up being a major gateway to the internet for millions of New Yorkers who can't afford service at home. While there are only a handful of kiosks installed at the moment, LinkNYC plans to have 500 up and running by July. They'll remain in beta testing until around 200 units are deployed, according to representatives, and by 2020 the group plans to have at least 4,450 kiosks in the wild. 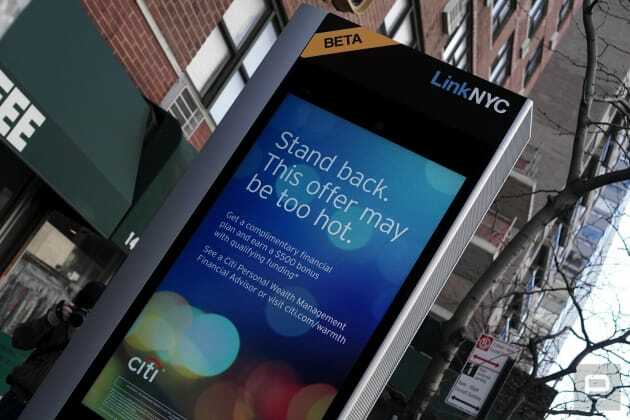 It's tough to tell if LinkNYC will reach its long-term goals, but the fact that it was able to develop and deploy its kiosks in about a year is impressive.